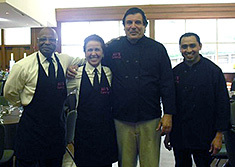 After many years as an accomplished pastry chef, Avi Cohen established Avi-ously Delicious Catering Company in Marin County in 1992. Coming from a family who spent endless hours in their kitchen experimenting with various cuisines and cooking techniques, Avi developed a sincere love of food and creating healthful, unique, delicious recipes and menus. Using the finest spices and ingredients from around the world, combined with his finely-tuned culinary skills and easy-going personality, he has provided his clients with scrumptious and beautiful dishes, superb service and simply unforgettable events. Whether your catering needs are for 25 or for large groups up to 500 guests plus, Avi-ously Delicious Catering works closely with you and tailors all menus to an array of personal tastes and budgets. Avi-ously Delicious is fully licensed and insured. Avi-ously Catering is a full service Marin County catering company and event planning company providing catering services in San Francisco, Marin County, Napa County and Sonoma County, including the surrounding areas of San Rafael, Novato, Mill Valley, Sausalito, Kentfield, Ross, Tiburon, Napa, Petaluma, San Jose, Oakland and more. Avi-ously Delicious Catering offers imaginative menus for corporate meetings, cocktail parties and Bar / Bat Mitzvahs. ©2018 Avi-ously Delicious Catering | 41 Hamilton Dr. Ste G, Novato, CA 94949 | Website by Minkin Design + Marketing.